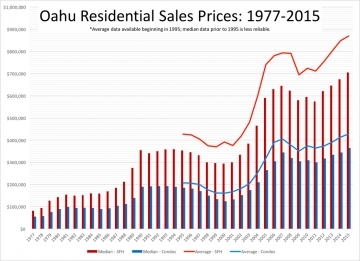 Oahu's housing market makes for a historically reliable investment. But will that continue? That's the main question everyone's asking this year. Over the past 41 years, both single family home and condo prices have made a steady march in the upward direction. For the full history, check out the following chart. You can click here to see a spreadsheet where you can have get a better look at the data. I've gotten several questions over the years about rent-to-own deals. It's important to understand conceptually what's going on in a lease-to-own situation. Normally what happens is a buyer can't buy a property outright. Either they don't qualify, or they have other uses for their cash, or there is some other limitation preventing them from the buying the property in the first place. That's when they think, "Aha! I'll just rent-to-own. That way some of my rent will go towards a purchase." And sometimes sellers think that's a great idea, too. Except almost always both of those sentiments are incorrect. If you want to buy a home in Kaneohe or Kailua with a VA loan, you’re probably going to be competing against several other buyers. 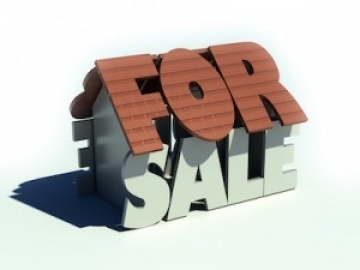 You may also have heard that sellers are a bit skittish about VA offers which, generally speaking, is true. Let me explain why, and then I’ll discuss possible actions you can take to make your VA offer more appealing to sellers. The policy behind the VA loan is that the Veteran’s Administration wants qualified veterans or active duty military to be able to purchase a home without putting money down. Note that the VA doesn’t lend money; it guarantees to the bank lender that the loan will be paid. So you’re still dealing with a private bank for obtaining your loan. If you’ve ever talked with anyone about buying or selling real estate, at some point you may have heard the word “escrow” used in a bunch of indecipherable ways. From experience I know “escrow” is a word that everyone has heard and feels like they should know but often don’t. Don’t sweat it. I’ll break down the key points for you. 1. What does “escrow” mean anyway? Let’s start with the basics. “Escrow” is when a third party holds stuff on behalf of two parties to a contract. Think about it this way. If you’ve lived in Hawai’i longer than two years, I’m sure you’ve noticed by now that friends from the mainland jump at the chance to visit your humble abode. Sometimes, you’ve done all the generic bucket list things with all the friends and you’re completely exhausted by the second wave of visitors. They take off work, they book flights, they spend hours on Pinterest and Instagram making life decisions, like whether they want to hike Diamond Head or Koko Crater. Amidst all their fantasizing, you’re wondering what you’re going to do with them while you’re at work because the number on your rent check or mortgage payment tells you that you can’t afford to take seven days off. 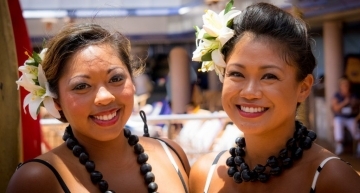 Whether you’re planning on visiting or moving to the Hawaiian Islands, language is sure to be one of the first things you notice when your plane lands. The flight attendant will likely welcome you to the islands with aloha ahiahi e komo mai i ka Hawai’i malama pono a hui hou. You may then need to catch the Wikiwiki shuttle from one side of the Honolulu Airport to the other. Where, if you’re lucky, you’re greeted with a lei. If you’re shopping for property on Oahu, sooner or later someone will mention canec. What? you ask? Here’s the skinny. Canec (pronounced CANE-ick) is a building material that was used in the 1930s to the 1960s on Oahu. It’s a fiberboard that was made out of the remnants from sugar cane processing. Builders used the material for ceilings and interior walls. While fewer and fewer homes still have canec in them, it’s always good to ask because the kicker here is that canec contains arsenic. If the material is undisturbed and not rotting, no problem. How much will flood insurance cost for this property? A client asked me that a while ago about a particular house in Hawaii Kai. Here’s the honest answer (which I gave): I don’t know. But I told her I’d find out. Recently there has been a rash of reports (here for example) about skyrocketing flood insurance rates on Oahu. The question for a buyer looking at several properties, though, is How much will flood insurance cost for this property when compared to that property? I ran across a couple of cautionary notes for home sellers in some real estate research, so I thought I’d share. Both notes warn you not to overprice your home when you’re trying to sell. [H]igher initial overpricing reduces the probability that the property will sell. [O]verpricing and extending marketing time, perhaps by rejecting a viable offer, are costly strategies that can contribute to marketing failure. You’re buying a condo on Oahu. It comes with a big fat pack of boring but important documents that cost $300-$500 (usually charged to the seller). But let’s be honest. You really only glance at the docs with glazed eyes. If that. Let’s talk about what these docs are and why they’re important. Condo docs come in two basic flavors: the rules docs and the operational docs. These tend to be less rules-based and more action- or operations-based. In the Oahu real property market, you’ll often see certain properties, especially (but not always) condos, that are priced waaaayy below comparable properties. In pretty much every case, though, the simple truth is that this particular homebuyer has found a leasehold property for sale. Leaseholds are common in Hawaii but not elsewhere. Throughout most of Hawaii and the rest of the U.S., fee simple is the most prevalent form of real property ownership. 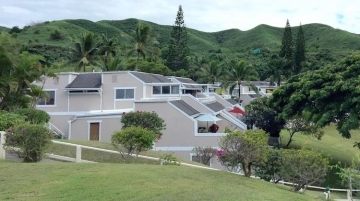 Oahu’s housing market makes for a historically reliable investment. Over the past 40 years, both single family homes and condos have made a steady march in the upward direction. For the full history, check out the following chart. You can click on the chart to see a spreadsheet where you can have get a better look at the chart and its data. The upshot is that the Oahu market tends to go up, sometimes a lot and sometimes a little. Every now and then some backpedaling is in order. But overall, there’s one general direction: up. Yes. But not much. Usually. That’s the short answer, based on historical data going back to 1977. In 38 years of data, median single family home prices decreased in only 11 years. Just two of those 11 years had declines of more than 4%: 1998 (-9.84%) and 2009 (-7.05%). As you can see, median condominium sales track very closely with single family homes, and average sales of each also look quite similar. And that raises the question: What’s the normal annual increase in prices? Looking at median data over the full 38 years, single family home prices have increased at 6.31% per year while condos have gone up 5.70% per year.